As gas prices continue to rise, so does the search for vehicles that are more fuel-efficient. But what if you’re interested in a vehicle that requires no fuel at all? This is where electric vehicles come into play. There are plenty of electric vehicles out on the market today, and while they may fulfill your need for a gasless car, they do nothing for you in terms of style and performance. If this is a dilemma you find yourself in, then Mitsubishi has you covered. You never have to sacrifice style, amenities, or performance when you chose the 2016 I-MIEV as your next electric car. If you’re liking the sound of this, then make your way over to Fayetteville Mitsubishi in Fayetteville immediately to take a look at the 2016 I-MIEV. You won’t believe how great this car is until you actually step foot into it. If you are in the city of Fayetteville, Fort Bragg, Hope Mills, Raleigh, Wilson, or Newton Grove, Fayetteville Mitsubishi would be happy to serve you, so head on over today. If you’re an advocate of the environment, then you’re going to love what we have to say about the 2016 Mitsubishi I-MIEV engine. First things first, the 2016 Mitsubishi I-MIEV comes in only one available trim: the ES. This means that you don’t have to worry if you’ll be getting all the best features the model has to offer since everything is all rolled into one amazing model. The 2016 I-MIEV comes with an AC synchronous permanent magnetic motor. It comes with a Lithium-ion battery and is powered by AC electricity. 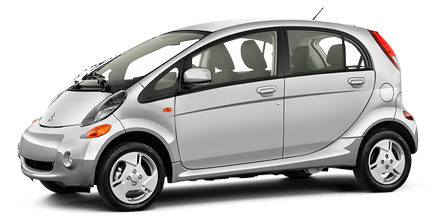 The I-MIEV has a Single Speed, Fixed Reduction Gear Transmission and gets 66 horsepower and 145 lb-ft of torque. Because it is an electric car, it is also considered a Zero Emission Vehicle (ZEV). This means that it runs on a clean motor that doesn’t produce any type of emissions. A perk of owning an electric vehicle also means you don’t have to worry about spending money on gas, transmission overhauls, oil changes, or any other type of combustion-engine specific maintenance. If you’re looking for a great electric vehicle, the 2016 Mitsubishi I-MIEV should be at the top of your list! You already know the 2016 Mitsubishi I-MIEV is a great vehicle, but you may still have some questions on your mind. For example, what does the I-MIEV offer when it comes to safety? Well, worry about this question no longer. Mitsubishi wants drivers to feel safe and secure when it comes to the 2016 I-MIEV, and you might actually be shocked to learn how many safety features the vehicle actually contains. Some standard safety features that you will find on the 2016 I-MIEV include Front seat belts with pre-tensioners and load limiters, LATCH System (Lower Anchors and Tethers for children), 3-point seat belts for all seating positions, Active Stability Control (ASC) with Traction Control Logic (TCL), High voltage cut-off system, Vehicle Immobilizer System, Vehicle Security System, Low battery warning indicator, Driver and front-passenger seat mounted side-impact supplemental air bags, and more! That’s a lot for a compact vehicle. The 2016 Mitsubishi I-MIEV is one of the most affordable electric vehicles that you will find on the market, which can come as a surprise to those who may have thought owning an electric car was out of their reach. Now that you know a little more about the I-MIEV has to offer, if you’re ready to take the next step then head over to Fayetteville Mitsubishi located in Fayetteville, NC. Here, you will find our friendly sales professionals who will gladly take you on a test drive of the 2016 I-MIEV. Once you decide that you love it, they will work hard to help you take one home tonight.